This lovely piece can be worn casually, too. Great combination of emeralds and diamonds. 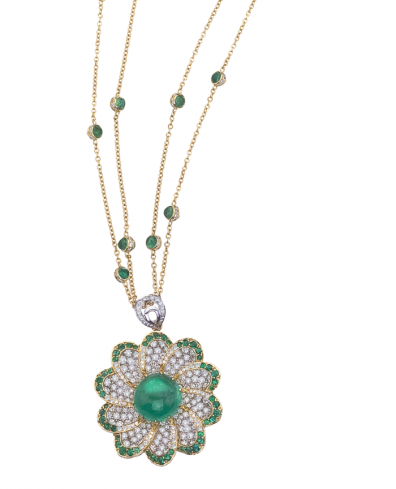 Emerald and Diamond Flower Power Pendant in 18KT yellow gold, set with 103 emeralds with a total gem weight of 19.74cts. and 428 diamonds for a total diamond weight of 6.96cts. Chain for necklace is 18KT yellow gold with diamonds and emeralds set in chain.